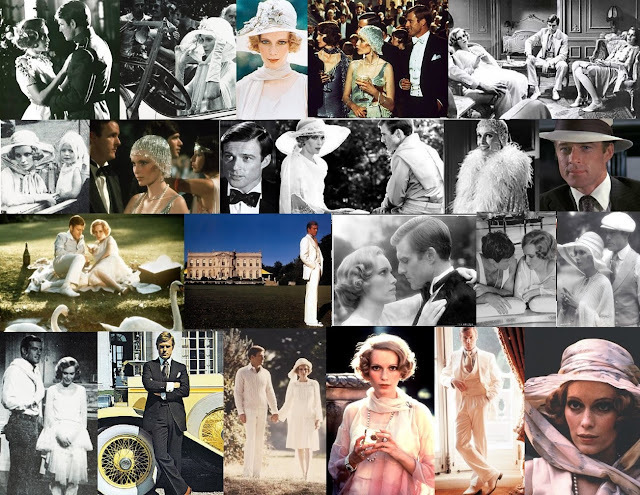 When I was fourteen, I feel head-over-heels in love with this adaptation of The Great Gatsby. I hadn’t read the book, mind you, so my basic understanding of the story was that an adorably flighty socialite had an affair with a suave millionaire, all the while the guy from Law and Order just stood in the background. For years after that, I nursed an obsession for the costumes Ralph Lauren designed for the film, and frequently cited the movie as ‘incredible.’ Upon viewing this film again, my opinion of it has changed. No longer are the gorgeous costumes, perfect settings, and lush music blinding me into thinking that this film is without fault. First of all, I think it says something that the first thing I loved about the film was the way it looked. It was still true for me that while I was watching it again I was struck by how beautiful everything and everyone was. Well, except for the actress who portrayed Myrtle – she sort of scared me. The film succeeded in capturing the shallow beauty of the time, but I think it relied too heavily on that, and, in doing so, it turned one of the most celebrated stories of the 20th century from a character study into a costume movie. It is an issue of style over substance. Mia Farrow plays Daisy as a fragile, naïve wife in a jittery way that makes me imagine her as Rosemary Woodhouse, but instead of mod shift dresses and a Vidal Sassoon haircut she’s wearing flapper dresses and finger waves. I’m not sure that she was the most appropriate person to play Daisy, but she played the character well. Robert Redford is just too pretty (in a masculine way, of course) for me to believe him to be the guy from the wrong side of the tracks who is a bootlegger and swindler. If the perfect ‘All-American Man’ were to exist, it would be Robert Redford. More specifically, it would be Robert Redford as Jay Gatsby. Overlooking his appearance, he gives a pretty decent performance. My only critical note was that Redford carried himself throughout the film as a rich man, not as a newly rich man. I was intimidated by Redford’s Gatsby, not intrigued by him. Sam Waterston’s portrayal of Nick Carraway was a great performance, although not quite at all like the Nick I imagined in the book. Waterston’s Nick has this sort of wide-eyed look to him most of the time as though he is more baffled by this crowd than fascinated. I think what keeps this film from being superb is the fact that it’s really long. The appeal of Fitzgerald’s novel is that it’s exciting and quick – just like the Roaring Twenties – all the while remaining poignant and beautiful. I think that the production team was too consumed with crafting every bit of the film to be just right that it came off being very structured and crafted. The director’s choice to make the film almost two and a half hours long makes the story seem stilted and sluggish. And there are way too many awkward silences between Daisy and Gatsby to consider theirs a torrid, passionate love. While I do respect Coppola’s efforts to translate as much of the original text into the screenplay, I thought that using so much of Nick’s narration and turning it into dialogue didn’t quite work.